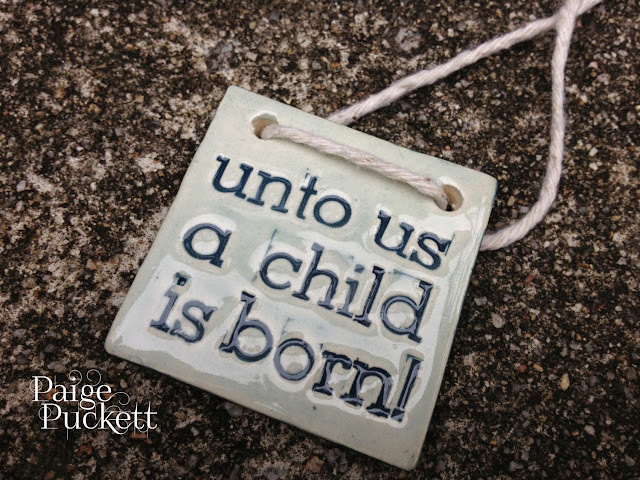 For several years now, we have made Christmas ornaments from clay. Last weekend I brought my supplies into the kitchen to finish up a couple requests from friends, and my kids descended on the makeshift workspace and demanded clay and all my tools. 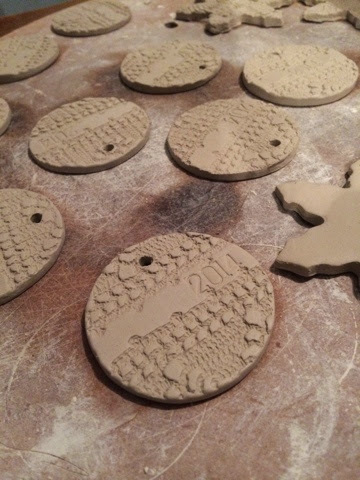 After a morning of wresting on the living room floor and failed attempts at controlling the noise level in the house, the silence that their focus on the clay brought was amusing, even if it took me five times longer than if should have to roll out a couple Texas ornaments. 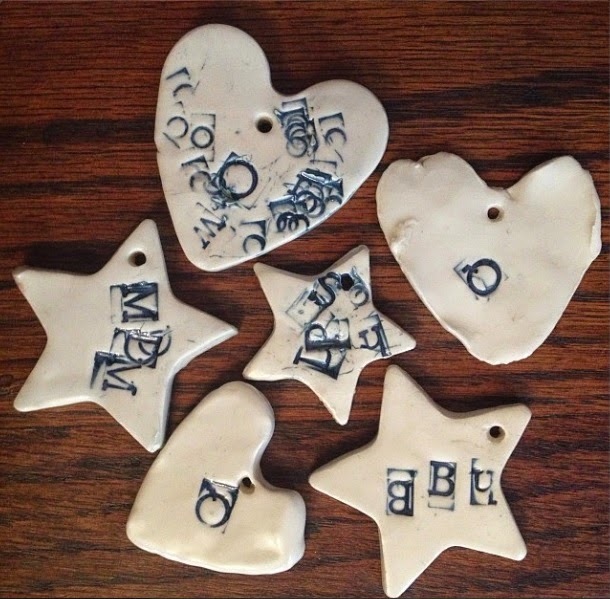 Basically anyone who has access to clay and a kiln could make charming ornaments with relatively little experience. 1. Roll out wedged clay to desired thickness. Typically I shoot for 1/4". I also use absorbent bats to work on. I know this is terrible for the bats in the long run, but I'd rather protect the kitchen table, and I don't currently have any flat boards laying around to work on. 2. 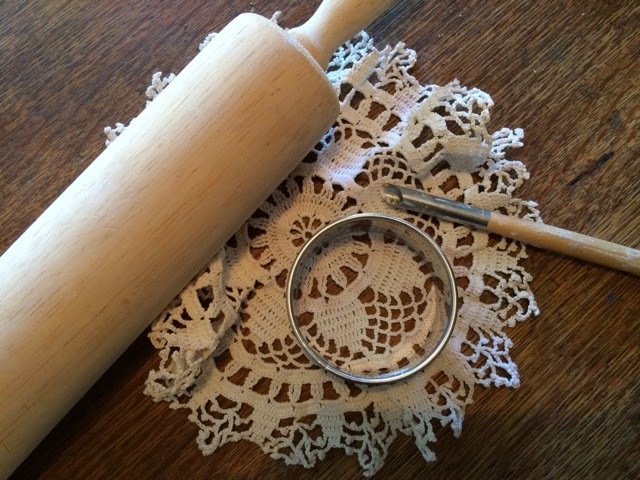 Lay the textured material such as lace or a Rubber Texture Mat on the clay and use the rolling pin to press it into the surface of the clay. Be sure not to press it too deeply or the clay may overlap the lace threads and cause the edges to booger up when you lift the lace. Always do this base texture step before using the cutter or else you may lose the shape your cutter makes. 3. Use a cookie cutter to press out your shape. If the clay is super sticky, letting it firm up a little before using the cutter can help keep the ornament flat as you lift up the cutter. Any time you lift up corners and bend the ornament, the clay will curl in those spots during firing. (I'm about to unload a batch of curly states). 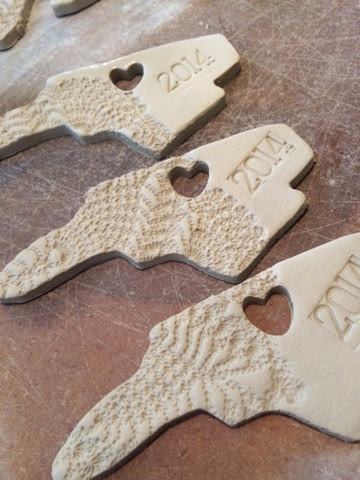 I ordered my cutters from the "Cookie Cutter Guy" on Etsy. 4. Complete any other surface decorations such as letter stamps or carved designs once the surface is no longer sticky or too soft. 5. 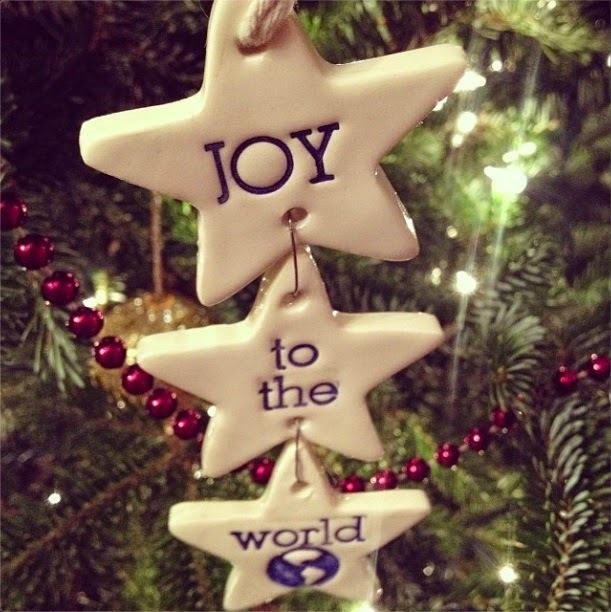 Use a mini cutter or a hole cutter punch for the ornament hole where you will attach string or ribbon. Remember that the hole will shrink in the kiln, so be a little generous with your hole. These were a last minute addition to the ornaments this year. 6. Once leather hard, clean up the edges. 7. 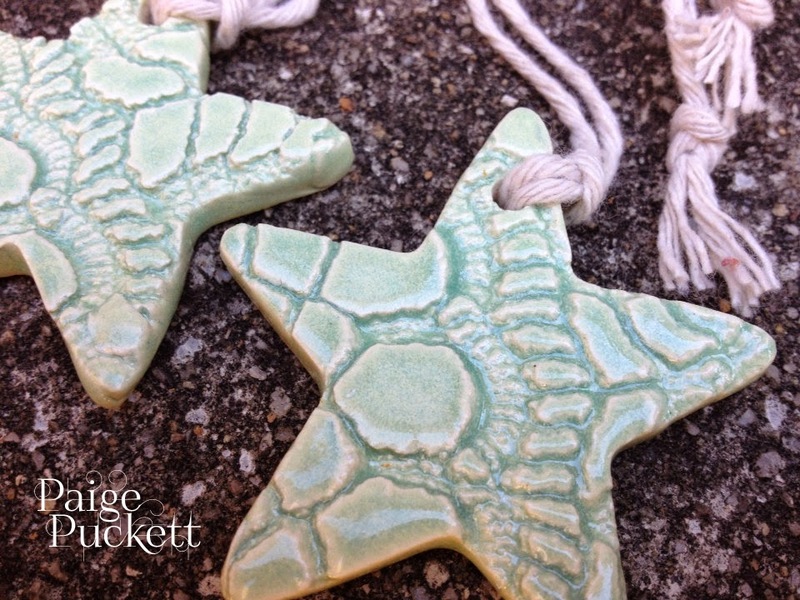 After the bisque firing, you can paint on these with underglaze, brush on overglaze, or leave the clay as is. 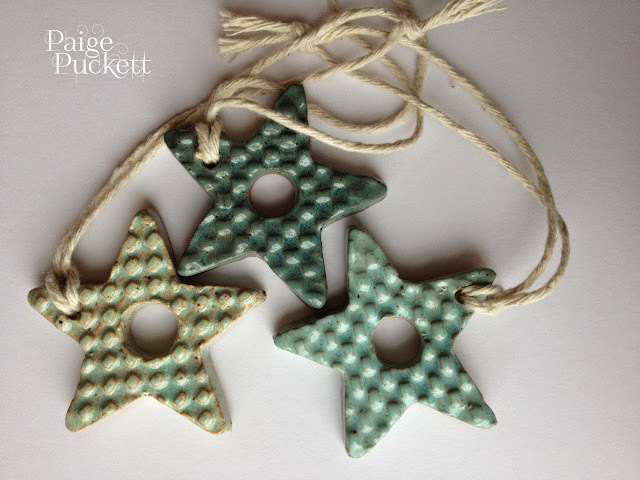 When using a lace imprint, I like using a combination of blue underglaze and clear overglaze. If you have a bead tree, you can even glaze both sides. This year I purchased five states: NC, VA, FL, TX, and OH based on where my siblings live and a couple special requests from a good friend. 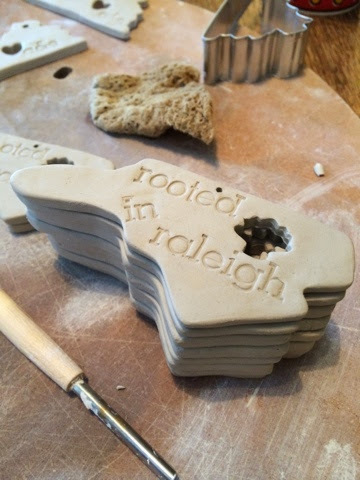 I will say that state ornaments were not the most unique idea I've had, just do a quick search on Etsy if you want proof, but they were a fun way to personalize gifts for my family and friends. If I ever get back into art/craft shows or reopen my Etsy store, they'd probably sell easily enough, but I have to make sure I at least unload this round in the next few weeks as I stamped most with "2014". I'll be sure to update this post with pictures once they are complete! Joe thinks these look more like foam finger pointers than NC... I agree. I found mini cutters at a craft store. I still wish I had an acorn for Raleigh! I made my own globe stamps for this line or ornaments. Die Weihnachtsanhänger sind wunderschön geworden. Oh, these are great tips! I'm always battling those sharp edges, so the plastic sounds very helpful. Thanks! Is it air dry brown clay? Midfire white clay "Little Loafers".